The story of "Curry's Angel"
At the age of 18, my mind was opening up... a lot. I was finding my chosen faith of Born Again Christianity much too limiting. The particular sect I was in left no place in God's world for my Jewish friends, my homosexual friends and my friends raised without organized religion, etc. So, I asked the same friend, who took me in 1979, if she'd be willing to re-initiate the new me into the R.H.P.S. That fateful night I fell in... love (or is it lust) with, as I put it, "that man in the fishnets and corset" and wanted to be part of it all. I was obsessed, trying to find every book written on the film and on Tim Curry - and I found them everywhere! In that same year, I read Sal Piro's Creatures of the Night and read about Dori Hartley. I told all my new Rocky Horror friends that "Angela Theresa Egic is going to be the next Dori Hartley of Rocky Horror!" This was also around the year I was officially titled "Curry's Angel". "Angela! Who do you think you are, Tim Curry's angel or something?!!" (I'd like to note this was before angels became all the rage, too). I responded, "Yeah, Max, I am his angel! That's why my mother named me Angela!!" Soon after two other cast members and I began our 70's tribute as "Curry's Angels" with us two Angela's and our Columbia - I was Jaclyn S@&t!, then the other Angela, with the hair was Farrah F&^ked Up and Kate Jackass. I kept the "Curry's Angel" name, obviously. I was the biggest Tim Curry fan of our group! And that's how I became Curry's Angel in 1983 - which leads me back to my becoming the next Dori Hartley. The ways I most wanted to be like Dori was to become famous in the R.H. circuit and to actually know Tim Curry!! At this time I didn't have the "balls" to consider even playing "Frank N. Furter" in a cast. I was pretty content with Janet and Magenta. 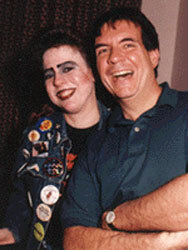 Thus, the first thing I did on my road to R.H. fame was to write the fan club president, Sal Piro. I ordered a "Tim Curry Fearless shirt" and wrote him a note of how much I adore Tim Curry and the show. He wrote me back!! Little "Curry's Angel" got a little from someone Dori Hartley was close friends with!!! Sal told me the medium t-shirt I ordered was gone and he only had a small one left... did I want it? I said "Yes" even though I like my shirts big. The next few years many things happened. Most importantly, in 1984, I was accepted to The American Academy of Dramatic Arts in New York City. I arrived in NY on October 12, 1984, only two weeks after my 21st birthday. My goals: to go to 8th Street Playhouse, meet and become friends with Sal Piro, join the cast and meet Tim Curry and become friends with him too! This, or course, would make me quite famous in the R.H. community! My first visit to The 8th Street Playhouse was rather interesting, a whole different crowd from the Phoenix group. Met Sal before the show and asked about being in the cast, he said he did need a female Magenta. Culture shock city for me! But I had yet to get together a full costume, and that was an 8th Street requirement. By the time I got things together Sal had a full cast and didn't seem to interested in either knowing me nor casting me. I was this annoying Tim Curry fan always sitting in the third row trying to out-scream the resident 8th Street cast Tim fanatic, Michelle Reinfeld. I boasted to everyone there how I was going to know Tim Curry and he was going to know me. They all thought I was just another young, fly-by-night, Rocky Horror fan, never to be seen again. But this Girl from Arizona who called herself Curry's Angel never went away! Eventually, I became a regular audience member of 8th Street, and as much as I annoyed a lot of the cast, I slowly began to fit it. They stopped calling me "the Girl From Arizona" and started to accept hat I was indeed "Curry's Angel". Later, living in Brooklyn... there was a theatre, The Marboro, which showed R.H.P.S. on Saturday midnights only. I approached the manager of that theater and several of the 8th Street regulars and asked if we could be the resident cast of Brooklyn. The manager agreed and gave us a date that we could try it out. And as true and dedicated fans of the 8th Street cast, we still went into NYC on Friday nights, and for anniversaries. Our show was only on Saturday nights. In the two or three years that the show was in Brooklyn, several of our cast members became 8th Street regulars. In fact, some of our originally Brooklyn cast are still involved with the fan club and the NYC Cast! And Sal Piro has had me involved in some convention and a Halloween t.v. special on cable! I've also appeared as "Curry's Angel" at the 10th Anniversary in NYC and the 15th Anniversary in Los Angeles. 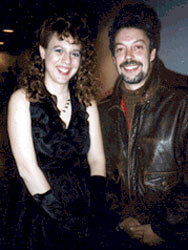 To make a long story short (too late)... On August 28, 1987 at about 6:00 p.m., in New York City - I met Tim Curry! he was in rehearsal for the Broadway touring cast of Me and My Girl. I tracked him down through my friend who worked in "the Broadway Circuit" and met him... by myself, and I made quite an impression! It would take several more pages to explain what happened with me and Tim and why, to this day, he knows me by name and calls me his angel when we do see each other. The interesting part, Tim and I never discussed R.H.P.S. the whole 20 minutes we chatted during that first meeting. It just didn't come up. I retired a couple of weeks after the meeting. In 1992, I volunteered to use my years of RHPS experience to do a column, in a now defunct fanzine by Mad Man Mike called When Madness Takes Its Toll. When Mike decided to end his fanzine I started my own. I premiered it at the "1993 Mini-Con" in Washington, DC. I titled mine The Unconventional Conventionalists R.H. Newsletter. For more info on my R.H. newsletter, which began as a bi-monthly publication and quickly turned into a twice a year on annual one; is still being published! I find it really difficult to work full time, act and rehearse nearly full time, write scripts and sleep and eat, plus get the RH newsletter written, printed and mailed except once to three times a year. When I do get it out, my reviews by subscribers are excellent. Write me too, about my "un-official" Tim Curry Fan Club. Since 1992, I've been in, mostly, full retirement from the performing aspect of the RHPS; besided the occasional convention and/or anniversary which I sometimes attend in full costume. In a way I did achieve my RHPS dream. I've been pursuing my real dream of acting, since way before my R.H. years actually. And now, my goal is to make my living as an actress and screenwriter. I moved to southern California in March 1997.